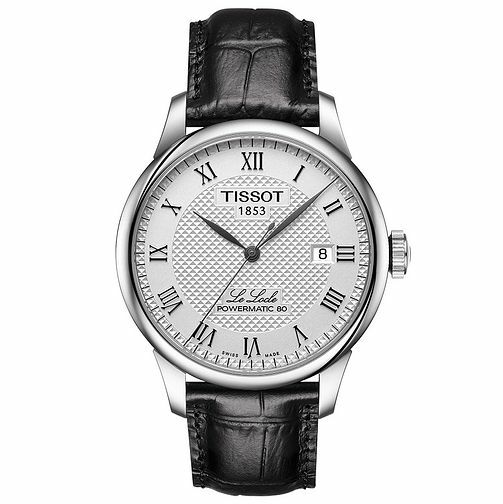 This Tissot Le Locle is a sophisticated timepiece for him, powered by automatic movement and offering a power reserve of 38 hours. Featuring a slim, round stainless steel case teamed with a luxurious black leather strap, the watch is finished with a simple white dial complete with date window and traditional Roman numerals. Classic Swiss timekeeping. Tissot Le Locle Men's Stainless Steel Strap Watch is rated 5.0 out of 5 by 2. Rated 5 out of 5 by Anonymous from Good sized, quality watch I have a slim wrist so this watch works well for me. Simple, elegant classic face and quality strap. This is the first automatic watch I have purchased so slightly disappointed to find out that this kind of watch isn't 100% accurate (mine loses roughly 4-5 seconds a day). Overall though very happy with the watch! Rated 5 out of 5 by Anonymous from Quality watch Lovely looking quality watch face not too big so suits my small wrist.